The IHSA turned 50 right around the time of 2017 IHSA Nationals in Lexington, Kentucky May 4th through 7th. IHSA Founder and Executive Director Bob Cacchione (front row, center) poses with all 38 Cacchione Cup entries during horse draw for the division on May 5th. The camera was only able to fit in about 25 of the 38 riders. LEXINGTON, KY - Save for a surprise in the individual AQHA High Point Rider competition the programs with history on their side prevailed at 2017 IHSA Nationals. 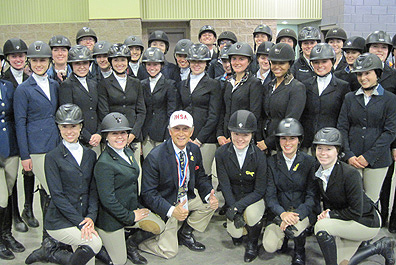 Savannah College of Art & Design became only the second team in IHSA history to win hunter seat High Point Team honors three consecutive seasons. The Bees were 32-27 winners over runner-up Centenary University, the latter of which has finished second two of the past three seasons. One year after sharing their first-ever Western Team Title with Berry College the St. Andrews University Knights had the round table all to themselves. Mark Mowbray won the final western team class (open western horsemanship) for St. Andrews to keep the Knights ahead of Black Hawk College. The final score was 27-24 with two-year school Black Hawk earning Reserve Champion honors for the first time in program history. Brittany Abernathy, a sophomore from Indianola, Iowa who competes for Northeastern Oklahoma A & M College, won the individual AQHA High Point rider award. Making her IHSA Nationals debut Abernathy had the top score in the rail phase. Like Black Hawk College, Northeastern Oklahoma A & M is a two-year school. Unlike Black Hawk, "NEO" has a short IHSA history, having competed in the 50-year-old organization for only the past four seasons. Abernathy is the first NEO rider to win a class at an IHSA Nationals event. While the top hunter seat rider was new to IHSA Nationals her team could hardly say the same. Katie Steiner, a Centenary University senior from Pleasanton, California, had been overshadowed to some extent in previous seasons by the likes of former teammate Cody Wooten and others. This season Steiner won a spirited three-way race within Zone 3, Region 3 for the right to compete at Nationals for the Cacchione Cup. The leading rider of five invited back to test after both the fences and flat phases, Steiner closed out four years in Hackettstown, New Jersey becoming the fourth Centenary rider in the past nine seasons to win the Cacchione Cup. Campus Equestrian will expand this article over the May 20/21 weekend to include more photos and more information about additional individual accomplishments. Until then, enjoy the results from all the classes! The 2017 IHSA Nationals Class-by-Class Results, held at Alltech Arena within the Kentucky Horse Park in Lexington, Kentucky May 4th through 7th. The Classes are listed in the order in which they were held. The hunter Seat Judges were Linda Andrisani and Steve Wall while the Western Judges were Deborah Kail and Mike Carter. Individual Open Equitation Over Fences: 1. Claudia Freeman, Rochester Institute of Technology. 2. Bridget Finnerty, Mount Holyoke College. 3. Stephanie Whitworth, University of California at Davis. 4. Michael Wallace, University of the South. 5. Marco Polo Uchoa, University of Findlay. 6. Thea Chafee, Colgate University. 7. Katie Steiner, Centenary University. 8. Danielle Forester, Call State - Fullerton. 9. Melissa Dander, Sacred Heart University. 10. Erica Hamilton, East Carolina University. Individual Intermediate Equitation Over Fences: 1. Sabrina Vlacich, St. Andrews University. 2. Hannah Tuckner, Skidmore College. 3. Alexa Glover, University of South Carolina. 4. Cory McLaughlin, Colorado State University. 5. Katie Groomes, Penn State University (State College). 6. Karly Clayton, Virginia Tech. 7. Claire Anderson, University of British Columbia. 8. Norah Young, Otterbein University. 9. Sophie Sahutske, Lake Erie College. 10. Ally Thomas, West Texas A & M University. Individual Novice Equitation Over Fences: 1. Caitlin Doocy, St. Lawrence University. 2. Madeline Davis, Randolph College. 3. Lindsey Ross, Middle Tennessee State University. 4. Timothy Fowler, University of Georgia. 5. Emily Wilmot, Delaware Valley University. 6. Carolyn McCurrach, Tiffin University. 7. Angela Cammarata, Centenary University. 8. Rebecca Ohman, Georgetown University. 9. Selena Haverlock, University of Akron. 10. Caroline Soane, Stanford University. Team Novice Equitation Over Fences: 1. Bobbie Jo Adsit, Emory & Henry College. 2. Kianna Taylor, University of Rhode Island. 3. Emilie Frede, University of Southern California. 4. Nicolle Wolf, Penn State University (State College). 5. Alexandra Lobo, Purdue University. 6. Sheriden Beard, Skidmore College. 7. Molly Coyle, College of Charleston. 8. Breanna Hertz, University of Findlay. 9. Tess Mroczka, Savannah College of Art & Design. 10. Rena DiPaula, Goucher College. Individual Intermediate Equitation On The Flat: 1. Zellie Wothers, Bridgewater College. 2. Claire Bick, Dartmouth College. 3. Skylar Laakso, Centenary University. 4. Megan Manning, Arizona State University. 5. Mallory Myers, Miami University of Ohio. 6. Meredith Denny, Savannah College of Art & Design. 7. Sean Muir, Wake Forest University. 8. Katherine King, University of Guelph. 9. Amanda Sakwa, University of Delaware. 10. Mollie Kowalchik, Mount Holyoke College. Individual Novice Equitation On The Flat: 1. Caroline Biggs, Vanderbilt University. 2. Meg Rauner, Dartmouth College. 3. Kristie Stamatis, Penn State University (State College). 4. Hannah Davis, Skidmore College. 5. Claira Seely, Cornell University. 6. Abby Alexander, Centenary University. 7. Olivia Blake, University of Mary Washington. 8. Emma Koprowski, University of Arizona. 9. Bobbie Jo Adsit, Emory & Henry College. 10. Jessica Wayne, Ohio State University. Team Novice Equitation On The Flat: 1. Lillian Hilgers, Savannah College of Art & Design. 2. Emilia Vawter, College of Charleston. 3. John Buckley, Centenary University. 4. Clea Lerner, Goucher College. 5. Sabrina Fox, Mount Holyoke College. 6. Cecilia Lang - Ree, Stanford University. 7. Samantha Schroff, University of Southern California. 8. Maeve Cruikshank, St. Lawrence University. 9. Breanna Hertz, University of Findlay. 10. Elijah Worth - Jones, Emory & Henry College. Individual Walk-Trot-Canter Equitation On The Flat: 1. Victoria Jenkins, Miami University of Ohio. 2. Amanda Collins, Virginia Tech. 3. Amanda Greenlee, Skidmore College. 4. Kiera Paulsen, Savannah College of Art & Design. 5. Sydney Cottingham, Louisiana State University. 6. Jessie Hood, University of Findlay. 7. Kaia Lindberg, Roger Williams University. 8. Elijah Worth - Jones, Emory & Henry College. 9. Marie Koder, Delaware Valley University. 10. Anne Halverstadt, Northeastern University. Individual Open Equitation On The Flat: 1. Michael Andrade, Centenary University. 2. Hayley Banister, Kansas State University. 3. Caroline McDaniel, Clemson University. 4. Morgan Hoke, Randolph College. 5. Erin Gaishauser, Kent State University. 6. Bridget Finnerty, Mount Holyoke College. 7. Courtney Poist, University of Alabama. 8. Hannah Tuckner, Skidmore College. 9. Natalie Nahirney, University of British Columbia. 10. Stephanie Whitworth, University of California at Davis. Team Intermediate Equitation On The Flat: 1. Madison Albano, Savannah College of Art & Design. 2. Shelby Keefe, Centenary University. 3. Lily Barnard, St. Lawrence University. 4. Lindsay Lucas, Purdue University. 5. Maeve Foley, Skidmore College. 6. Sophie Meserve, College of Charleston. 7. Bobbie Jo Adsit, Emory & Henry College. 8. Sarah Lummis, Goucher College. 9. Lizzy Traband, Penn State University (State College). 10. Alana Gillick, University of Rhode Island. Team Intermediate Equitation Over Fences: 1. Skylar Laakso, Centenary University. 2. Maeve Foley, Skidmore College. 3. Nicole White, Stanford University. 4. Melissa Stecklow, Penn State University (State College). 5. Alison Radgowski, Goucher College. 6. Claire Meyer, Purdue University. 7. Madison McKinsey, Emory & Henry College. 8. Meredith Denny, Savannah College of Art & Design. 9. Maddy Skrak, Mount Holyoke College. 10. Shannon Rice, College of Charleston. Team Open Reining: 1. Taylor Overmier, Ohio State University. 2. Selena Finn, University of Nebraska at Lincoln. 3. Kinsey Ayres, Black Hawk College. 4. Mark Mowbray, St. Andrews University. 5. Codi Uecker, Rocky Mountain College. 6. Kristen Wesoja, Cazenovia College. 7. Marissa Phillips, University of Findlay. 8. Maggie Lanham, West Texas A & M University. 9. AnnaLee Cooley, Berry College. Individual Walk-Trot Equitation On The Flat: 1. Hannah McColl, University of Findlay. 2. Celeste Jacobs, Hampshire College. 3. Seneca Tsang, University of Virginia. 4. Yinan Liu, Brown University. 5. Chris Matricia, Valley Forge Military College. 6. Laura Vasquez - Bolanos, Cornell University. 7. Hannah Eldridge, Morehead State University. 8. Alaina Kelly, University of Wisconsin at River Falls. 9. Samantha Vogt, Louisiana State University. 10. Ashleigh Davis, Cal State - Fullerton. Team Walk-Trot Equitation On The Flat: 1. Sidney Black, St. Lawrence University. 2. Martin Quaney, Kansas State University. 3. Kelly Cantwell, Skidmore College. 4. Carah Alexander, Stanford University. 5. Vincent DeLissio, Savannah College of Art & Design. 6. Honami Tanaka, Mount Holyoke College. 7. Shelby Nelson, Purdue University. 8. Elif Caynak, College of Charleston. 9. Kelsey Bergman, Emory & Henry College. 10. Jane Swanton, University of Findlay. Team Novice Western Horsemanship: 1. Brandon Morin, University of Findlay. 2. Anna Heusinger, University of Nebraska at Lincoln. 3. Allison Gossett, Black Hawk College. 4. Janelle Petruska, St. Andrews University. 5. Sarah Cooper, Berry College. 6. Gabby Tebo, Cazenovia College. 7. Jamie Siefert, West Texas A & M University. 8. Katherine Denune, Ohio State University. 9. Jessica Cunningham, Rocky Mountain College. Team Walk-Trot-Canter Equitation On The Flat: 1. Claire Womack, Stanford University. 2. Alison Santucci, Skidmore College. 3. Ally Bates, Savannah College of Art & Design. 4. Brianna Hallman, University of Findlay. 5. Elizabeth Wakeman, Goucher College. 6. Samantha Bledsoe, College of Charleston. 7. Brianna Seymour, Michigan State University. 8. Kaley Price, Purdue University. 9. Casey Jones, St. Lawrence University. 10. Robert Reyes, Emory & Henry College. Individual Open Western Horsemanship: 1. Mark Mowbray, St. Andrews University. 2. Margherita Guerra, University of California at Davis. 3. Taylor Overmier, Ohio State University. 4. Haley Ruffner, Alfred University. 5. Elizabeth Ellis, Berry College. 6. Selena Finn, University of Nebraska at Lincoln. 7. Lauren Martyn, Miami University of Ohio. 8. Marissa Phillips, University of Findlay. 9. Codi Uecker, Rocky Mountain College. 10. Krista Rodney, Northeastern Oklahoma A & M College. Alumni Equitation Over Fences: 1. Morgan Sollenberger, Emory & Henry College. 2. Jessica Fontanelli, Syracuse University. 3. Kayleigh Burke, Virginia Tech. 4. Tara Mathews, University of Connecticut. 5. Stephanie Ripka, Penn State University (State College). 6. Samantha Page, Syracuse University. 7. Alexa Prettyman, University of Kentucky. 8. Joyce Brinsfield, University of Kentucky. 9. Emily Heine, Northern Illinois University. 10. Katherine Deichmann, Kansas State University. Team Open Equitation Over Fences: 1. Tatum Tatreau, Savannah College of Art & Design. 2. Corinne Miller, Stanford University. 3. Michael Andrade, Centenary University. 4. Hannah Showell, College of Charleston. 5. Merle Beach, St. Andrews University. 6. Chris Johnson, Purdue University. 7. Siana Stanton, Michigan State University. 8. Hayley Banister, Kansas State University. 9. Bridget Finnerty, Mount Holyoke College. 10. Cary Hundley, Goucher College. Cacchione Cup Competition: 1. Katie Steiner, Centenary University. 2. Lauren Henry, University of Rhode Island. 3. Kelsey Sloan, Middle Tennessee State University. 4. Anastasia Bezsylko, Franklin & Marshall College. 5. Abby Johnston, University of Delaware. 6. Rebecca Hauserman, University of Notre Dame/St. Mary's College (IN). 7. Rachel Kowalczyk, Hartwick College. 8. Christina Antonucci, Lynchburg College. 9. Caitlin Kimmell, Texas Tech University. 10. Elizabeth Chenelle, Liberty University. National Reining Horse Association Individual Open Reining: 1. Kristen Wesoja, Cazenovia College. 2. Michelle McDowell, Grand Valley State University. 3. Lauren King, Middle Tennessee State University. 4. Mark Mowbray, St. Andrews University. 5. Delaney Rostad, Middle Tennessee State University. 6. Haleigh Hurd, Alfred State College. 7. Madison Quintanar, Cal Poly - San Luis Obispo. 8. Hannah Penny, North Central Texas College 9. Haley Ruffner, Alfred University. 10. Katelynn Greenawald, Slippery Rock University. Team Open Equitation On The Flat: 1. Michael Andrade, Centenary University. 2. Tatum Tatreau, Savannah College of Art & Design. 3. Siana Stanton, Michigan State University. 4. Lauren Henry, University of Rhode Island. 5. Avery Jackson, College of Charleston. 6. Hayley Banister, Kansas State University. 7. Nick Martino, Emory & Henry College. 8. Alyssa Simin, University of Findlay. 9. Kristen Blomstrom, Stanford University. 10. Lindsay Levine, University of Southern California. Alumni Equitation On The Flat: 1. Emily Kowalchik, Cornell University. 2. Emily Manos, Bridgewater College. 3. Alexa Prettyman, University of Kentucky. 4. Maggie Gordon, Lehigh University. 5. Tara Mathews, University of Connecticut. Emily Solan, University of Illinois (Urbana - Champaign). 7. Sarah Apgar, Ithaca College. 8. Kimberly Boyle, Washington State University. 9. Stephanie Ripka, Penn State University (State College). 10. Leal Morehouse, Boston University. Alumni Western Horsemanship: 1. Caitlin Arthur, Saginaw Valley State University. 2. Megan Carter, University of Kentucky. 3. Michelle Ivan, Saginaw Valley State University. 4. Jennifer Nagel Byrd, State University of New York at Oswego. 5. Rachel Walcoff, Ohio State University. 6. Casey Ryan, Ohio State University. 7. Tessa Churchill, Central Washington University. 8. Kelsey Neligon, Westfield State University. 9. Michelle Mohr, Tarleton State University. 10. Emily Watson, Murray State University. Team Beginner Western Horsemanship: 1. Katie Andrews, Rocky Mountain College. 2. Angela Bradford, St. Andrews University. 3. Madeline Misfeldt, University of Nebraska at Lincoln. 4. Mary Catherine Hix, Berry College. 5. Morgan Kromphardt, Black Hawk College. 6. Arienne Martinez, West Texas A & M University. 7. Alan Durden, University of Findlay. 8. Tori Gonzales, Ohio State University. 9. Shannon Fairbairn, Cazenovia College. Alumni Reining: 1. Caitlin Arthur, Saginaw Valley State University. 2. Cristen Cramer, Ohio State University. 3. Rebecca Folk, Lafayette College. 4. Erin Gendreau, Alfred University. 5. Sarah Todak, Ohio University. 6. Megan Carter, University of Kentucky. 7. Cody Koneski, Kutztown University. 8. Kimberly Storey, University of Tennesee at Knoxville. 9. Kayla Hawley, Central Connecticut State University. Team Advanced Western Horsemanship: 1. Haley McWhorter, Black Hawk College. 2. Jarret Vaughn, St. Andrews University. 3. Erin Bosse, Ohio State University. 4. Bailey Wertheimer, Rocky Mountain College. 5. Heather Grebin, West Texas A & M University. 6. Julia Roshelli, University of Findlay. 7. Mariel Wrench, Berry College. 8. Saralyn Darmstatter, Cazenovia College. 9. J'Nan Wittler, University of Nebraksa at Lincoln. Team Intermediate Western Horsemanship: 1. Allie Robertson, Berry College. 2. Dylan Lewis, University of Findlay. 3. Jordan Belanger, St. Andrews University. 4. Brittany Milam, West Texas A & M University. 5. Grayson Cottrell, Black Hawk College. 6. Sierra Nelson, University of Nebraska at Lincoln. 7. Cheyenne Knight, Rocky Mountain College. 8. Morgan Kiehl, Ohio State University. 9. Kristen Perry, Cazenovia College. Individual Advanced Western Horsemanship: 1. Anneleise Ritzi, University of Findlay. 2. Seth Rice, Penn State University (State College). 3. Rebekah Thomson, Rocky Mountain College. 4. Edson Varela - Hernandez, Northeastern Oklahoma A & M College. 5. Heidi Mueller, Black Hawk College. 6. Courtney Woodard, Berry College. 7. Dani Picard, Missouri State University. 8. AnnaLee Cooley, Berry College. 9. Lydia Yount, Miami University of Ohio. 10. Madison Henn, Eastern Illinois University. Individual Intermediate Western Horsemanship: 1. Megan Dulle, University of Findlay. 2. Katelin Garbani, Cal Poly - Pomona. 3. Taylor Soderholm, Alfred University. 4. Catherine Lach, Ohio State University. 5. Kendall Dudenhoeffer, St. Mary of the Woods College. 6. Alexandra Sievenpiper, Berry College. 7. Janelle Petruska, St. Andrews University. 8. Madeline Ketley, Mount Holyoke College. 9. Alexa Charlze Johnson, University of Findlay. 10. Amber McCreery, West Texas A & M University. Individual Beginner Western Horsemanship: 1. Emily Lambert, Berry College. 2. Sarah Newman, Youngstown State University. 3. Katie Daniels, Northeastern Oklahoma A & M College. 4. Amber Neuman, Ohio State University. 5. Daniel Hatch, State University of New York at Oswego. 6. Samantha Grams, Black Hawk College. 7. Erica Miller, University of Louisville. 8. Shelbi Sisson, University of Nebraska at Lincoln. 9. Steven Dennis, St. Andrews University. 10. Erica Helsley, Mount San Antonio College. Team Open Western Horsemanship: 1. Mark Mowbray, St. Andrews University. 2. Kinsey Ayres, Black Hawk College. 3. Codi Uecker, Rocky Mountain College. 4. Marissa Phillips, University of Findlay. 5. Catherine Johnson, West Texas A & M University. 6. Elizabeth Poczobut, Berry College. 7. Selena Finn, University of Nebraska at Lincoln. 8. Dana Reynolds, Cazenovia College. 9. Grace Tachikawa, Ohio State University. Individual Novice Western Horsemanship: 1. Dillon Vaughn, St. Andrews University. 2. Emma Willeke, University of Findlay. 3. Brooke Parrish, Black Hawk College. 4. Brianne Lenehan, Clemson University. 5. Mercedes Stover, Ohio State University. 6. Maggie Murphy, West Texas A & M University. 7. Kimberly David, Delaware Valley University. 8. Heather Grebin, West Texas A & M University. 9. Emily Hermance, Mount Holyoke College. 10. Mariel Wrench, Berry College. Individual AQHA High Point Open Rider Competition: 1. Brittany Abernathy, Northeastern Oklahoma A & M College. 2. Haley Ruffner, Alfred University. 3. Kristen Wesoja, Cazenovia College. 4. Kinsey Ayres, Black Hawk College. 5. Morgan O'Sullivan, State University of New York at Cobleskill. 6. Mark Mowbray, St. Andrews University. 7. Selena Finn, University of Nebraska at Lincoln. 8. Katelynn Greenawald, Slippery Rock University. 9. Michelle McDowell, Grand Valley State University. 10. Racheal Nordby, Oregon State University.